Legacy Five pianist Roger Bennett died Saturday as a result of complications encountered through his long battle with leukemia. He was 48. Legacy Five had been set to perform at Mt. Carmel Baptist Church on Signal Mountain on Sunday. Born March 10, 1959, Bennett grew up in Strawberry, Ark. In November of 1979, he fulfilled his life-long dream of being a part of professional Southern Gospel music when he was invited by Glen Payne and George Younce to join the legendary Cathedral Quartet. Though he would leave the group for two years (1987-1989) to serve as the president of Journey Records, he was the group's pianist at the time of the quartet's retirement in 1999. Following the retirement of the Cathedrals, Bennett and fellow Cathedrals member Scott Fowler launched Legacy Five. In 2004, he fulfilled another dream (having his own successful quartet) when readers of Singing News voted Legacy Five as the Favorite Traditional Male Quartet. Although an excellent singer, Bennett is best remembered as pianist - and often a comedian - for the Cathedrals and Legacy Five. 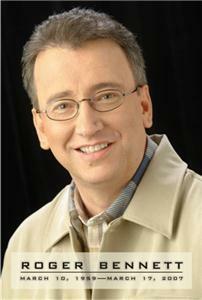 He received the Singing News Fan Award for Favorite Southern Gospel pianist 14 years in row (1993-2006). Songwriting was another forte' of Roger Bennett. Many of his songs appeared on the recordings of the Cathedrals, Legacy Five and many others. His writing talent was not limited to just songs, however. he was a contributing editor to Singing News, writing "Midnight Meditations." He leaves behind his wife (Debbie), their children (Chelsea and Jordan) and father (Doug). Funeral arrangements are pending.